With summer drawing to a close and autumn fast approaching, the garden is slowly but surely changing its technicolour dream coat of summer for its Butternut squash orange and seasonal autumn browns. There is still plenty of beauty to be seen in the September garden, however – and plenty of jobs to be done as well! Also, don’t forget to checkout the video for this months September seasonal colour blog. Its packed full of beautiful flowers alongside some fun facts too! I recommend the following plants for giving splendid colour in the month of September and beyond. 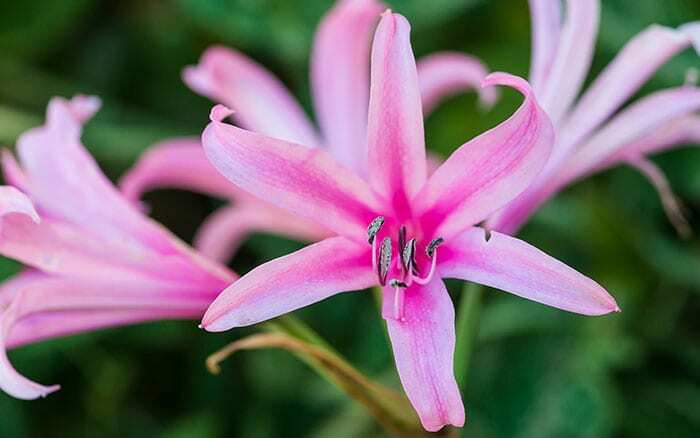 Native to Southern Africa, Nerines are a strikingly beautiful plant featuring large star-shaped flowers with prominent curling stamen on elegant long green stems. Flowers range in colour from lacy white to Lady Penelope pink to a pillar box red. There are about 26 different species of Nerine that have different growing conditions and differing levels of hardiness. For a hardy Nerine that does well in UK gardens, choose Nerine bowdenii. For best results, plant in well-drained soil in a sunny and sheltered spot with a little of the bulb exposed if in a warm area or deeper in the soil for frost protection if you live in a region that gets especially cold during winter. Nerines are fantastic for creating a tropical and exotic look in your garden, but it is best not to force them to compete with other plants for sun and nutrients. 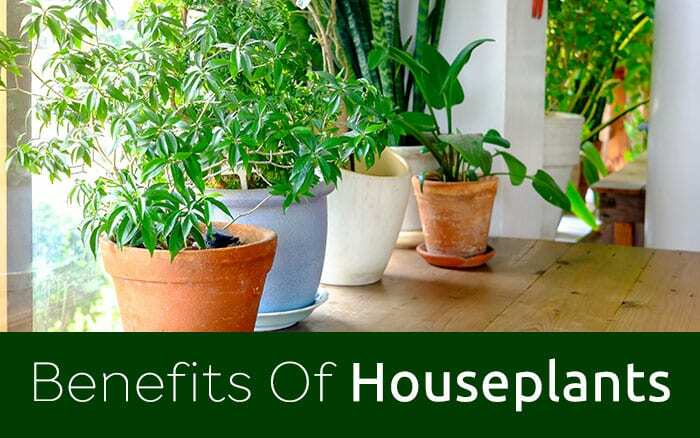 For this reason, planting them in containers might be your best bet if your garden borders are looking a little crowded. Also known as Spindle tree, this large deciduous shrub will bring plenty of interest and intrigue to your September garden. Around this time of year, its foliage becomes a colourful mass of captivating autumnal red while its flowers turn into delightful rose pink berries, which will split open to reveal Halloween orange seeds as autumn progresses. There’s quite simply no better celebration of autumn than this. 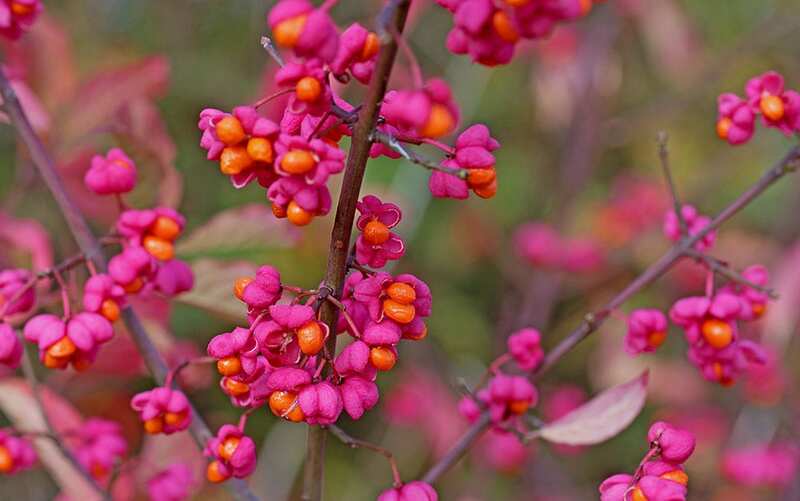 Spindle trees are extremely hardy and can withstand even the harshest of UK winters. They are happy in most garden positions, but require sun for at least part of the day and a well-drained soil. As such, it is wise to add a layer of horticultural grit to the bottom of the hole while planting. 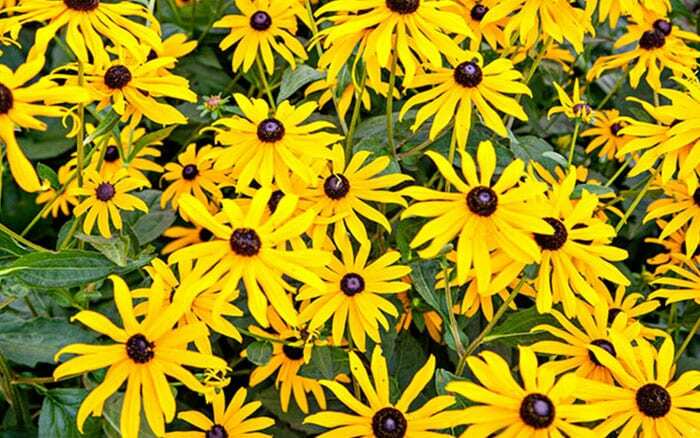 Rudbeckia, also known as Black-Eyed Susan, has daisy-like flower heads that practically glow with bright autumn colour. The golden petals surrounding the dark centres makes for a spectacular contrast which will brighten up any September garden. They work particularly well in wildflower meadows, colourful borders, cottage gardens or as a cut flower arrangement and they will keep flowering right through to the first frosts. Rudbeckias are easy to grow and will tolerate most conditions as long as they are in well-drained soil. The seed heads can be left on to attract birds into the garden in winter. Asters, which are sometimes called Michaelmas Daisies or Autumn Asters, are a group of late flowering, herbaceous plants that produce flowers through September and October. The beautiful aromatic petals are distinctly long and narrow, resembling those of a daisy and come in a range of vibrant colours. They can add colour to almost any garden and are perfect as cut flowers. 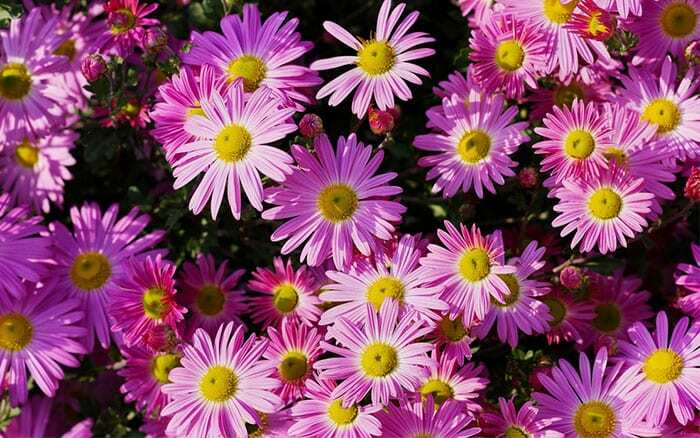 Asters require a moist but well-drained and moderately fertile soil, in an open location with full or partial sun. If these growing conditions are met, then they will need little or no maintenance or care. 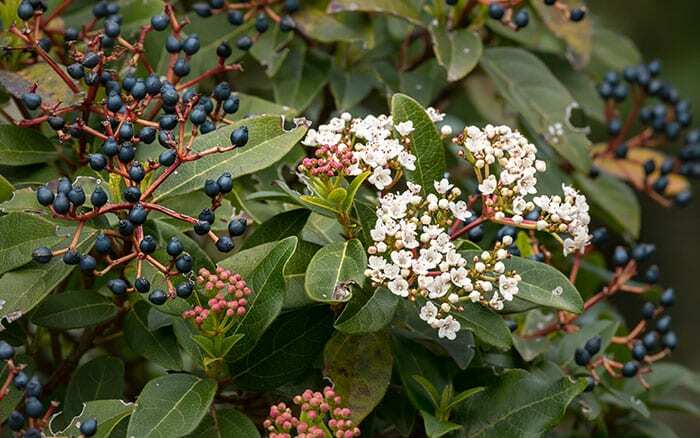 Viburnum tinus or laurustinus as it is also known, is a large evergreen shrub that produces clusters of small creamy-white flowers that are blessed with a faint pink tinge. Following the autumn, blue and black berries will appear, giving it a fairy-tale quality through the winter seasons. Despite being a Mediterranean plant, its hardy through most of Britain and works well in both traditional British settings and Mediterranean gardens too. For the best results, grow Viburnum tinus in a hummus-rich, fertile and well-drained soil. Protect from severe cold and drying winds to ensure long life. It’s a great choice for hedging or as an attractive addition to mixed borders. Also known as stonecrops, this hardy perennial has tiny star shaped flowers forming attractive flat tops above succulent foliage. The blooms come in a range of beautiful colours including pink, red, russet, gold, yellow and white and will attract the last of the seasons butterflies into your garden. It also makes a great green roof, alongside grasses and wildflowers. 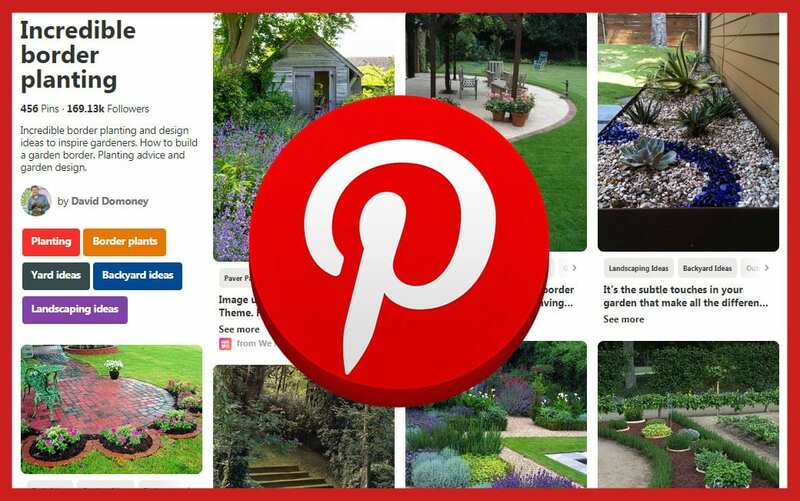 They vary in height from low-growing varieties for ground cover and rock gardens to taller versions for the perennial border. 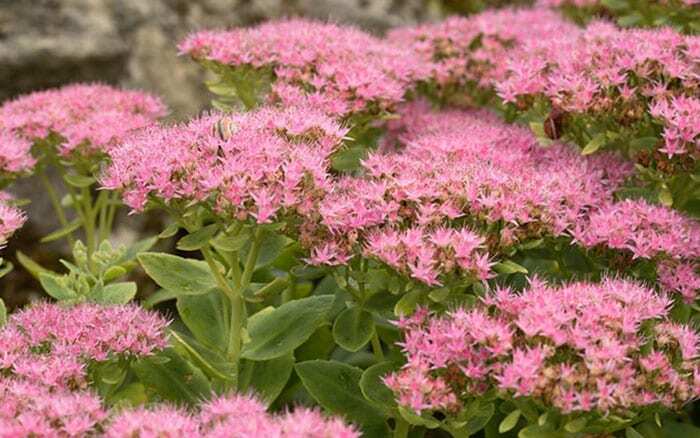 Sedums are extremely hardy, drought tolerant and prefer a well-drained soil in a full sun position.